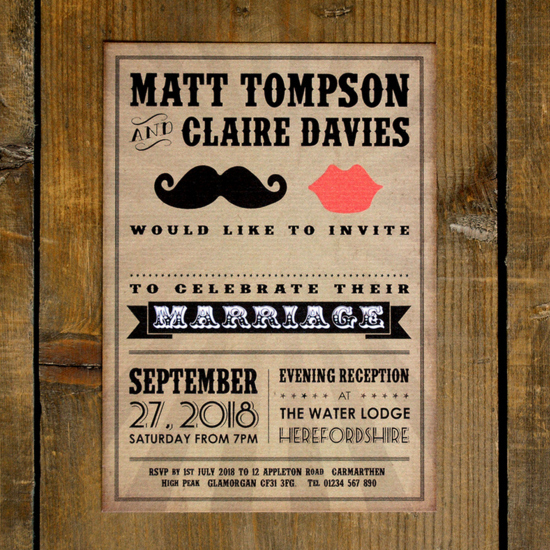 Calling all hipsters, cool dudes and fun-loving chicks, the Moustache & Lips wedding suite has arrived! Let your guests know that the wedding of the year is on its way with this fun and quirky design! Your guests will slip straight into the party mood once this little gem drops through their letterbox, and thanks to the outstanding quality, they’ll instantly know your wedding will be one to remember! We think this suite would compliment a fun and care-free style wedding, full of quirky props, a photo booth for wedding day snaps and maybe even a few beard or moustache inspired favours! Professionally printed onto 148 x 105mm (A6 size) deluxe ‘feel good’ textured 320gsm stock, this funky wedding suite perfectly combines excellent design with premium quality materials, to get your guests talking for all the right reasons! This wonderful wedding suite from Feel Good Wedding Invites, includes Save the Date, RSVP, Order of Service, Name Place tags, Thank You cards and lots more, so you can use the same great design throughout your wedding planning and celebrations. Not so sure about the colours? Fear not, for you can choose from 47 different colours so that your guests get a hint of what’s to come on the big day, whilst the reverse of the invitation is free for you to place all manner of important information, including directions, maps, wedding present information and anything else you can think of! Tags: His n Hers, Quirky, Rustic, Simple.